After fully unveiling the Vive Focus, HTC finally allowed lucky folks like myself to properly test out the six-degrees-of-freedom (6DoF) standalone VR headset. For the first time, I can actually walk around in VR without being tethered to a PC nor confined to a fixed space. 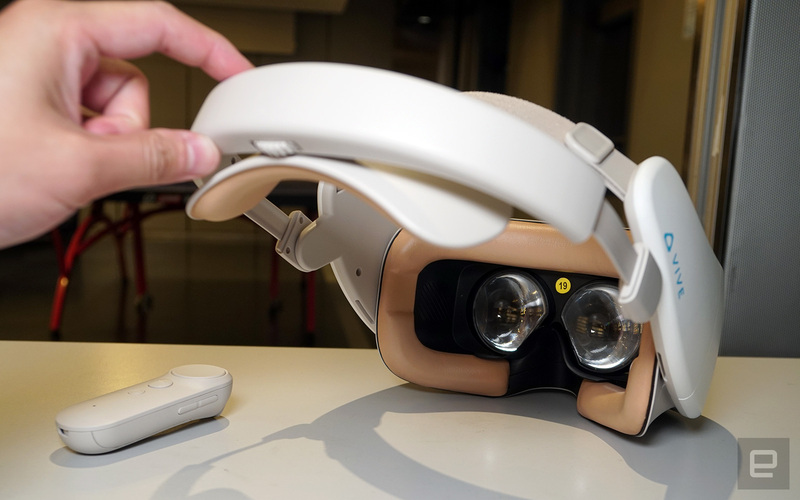 It's a truly mobile VR solution -- more so than smartphone-based VR headsets, which only let you look around on the spot (3DoF). Naturally, I used this opportunity to test this 6DoF tracking to its limits, even if it meant doing cartwheels while wearing the Vive Focus. Here's a quick recap of all the fresh details from last Friday: This Snapdragon 835 device is asking for around $600, and it features a 2,880 x 1,600 AMOLED display with a 110-degree field of view plus a 75 Hz refresh rate, along with a three-hour battery life, internal fan-cooling and a new white color option. Alas, there's still no word on how this inside-out tracking mechanism works, but it appears to be derived from Qualcomm's VR development kit. 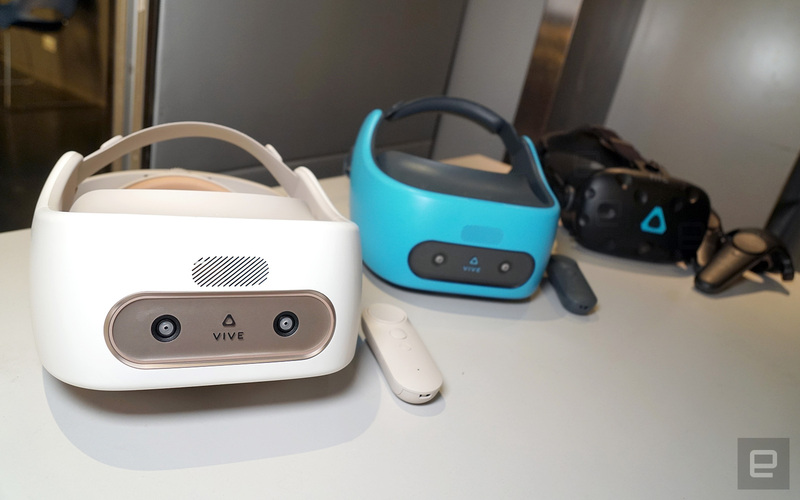 It's been a month since my initial hands-on with the Vive Focus, so I wasn't surprised to find the much-improved build quality on the latest batch of pre-production units. After all, the product is scheduled to ship in China next month, and that's after apparently outselling other VR products in terms of units (56 percent of total market share) and revenue (78 percent) on China's big "Double 12" sales day yesterday -- even at full price while the competition offered discounts. The plastic body now has a more refined finish, a tweaked nose rest to block more light and, more importantly, a new hinged neck support on the back strap for better weight-balancing. Instead of having to let demonstrators put the headset on me, this time I was allowed to do it all by myself, and I did so effortlessly, even with my glasses on: I just had to rest my face on to the cushion and then press the neck support inwards for auto locking. There was also a velcro strap at the top, which stopped the headset from slipping down my face. On and off, I had about one hour of total hands-on time, and at no point did I feel any discomfort, except for having to wipe the sweat off my masked face after some running around. Now that the developers have had more time with the Vive Focus, most of the ported apps I got to try performed quite well. For instance, Pillow's Willow VR Studio's puzzle adventure Spark of Light already had good 6DoF tracking, but this time it also didn't trigger any over-heating warnings during my two rounds of four-minute gameplay, so I could focus on playing god and guiding the kid through the beautiful fantasy realm. Likewise with Chesstar Studios' Great Header, which was just as stable as last time, though I quickly got bored of bouncing virtual soccer balls with my head and started doing cartwheels instead. I'd never dared to pull off a cartwheel in VR before, but thanks to the total mobility (and secure fit) of the Vive Focus, I was finally able to satisfy the gymnast inside me. To my amazement, it appears that the headset's tracking kept up with my extreme movements, too. I'd very much like to see actual gymnasts give this a go. I quickly got bored of bouncing virtual soccer balls with my head and started doing cartwheels instead. The biggest jump in improvement I saw was on HTC Vive Studio's very own Bowshot (from Arcade Saga), which has evolved from a sluggish prototype to a super-smooth first-person shooter. My legs didn't have to move much; it was mainly about firing at physical computer viruses using a bow, dodging enemy fire and picking the right attack mode according to enemy formation. I quickly became addicted, mainly because it's one of those seemingly-simple-yet-actually-challenging shooting games. My favorite demo of the lot was Kukrgame's Mercenary: The Italian Ops, in which I had to dodge bullets and fire back at enemy soldiers inside buildings. While the Vive Focus' Bluetooth controller only has 3DoF tracking, I quickly got used to it and still managed to enjoy this slightly odd shooting sensation. That said, the game could use more-realistic bot players: No soldier would stand out in the open while firing. 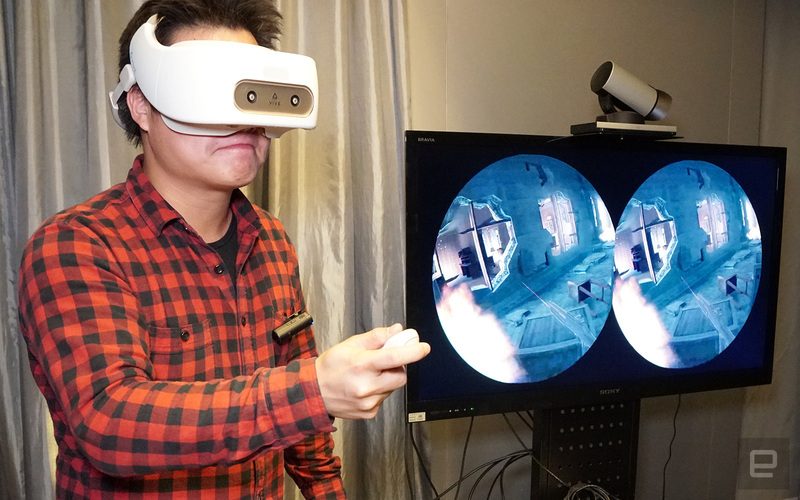 Another noteworthy mention goes to Configreality's infinite-walking VR experience, which gives the illusion of walking an infinitely long path within a confined space. In the demo, I had to walk through a series of chambers and collect large floating diamonds while dodging moving laser beams. As cool as this sounds, I quickly started noticing the moments when the software altered my path to keep me walking straight in the virtual world. It made me feel slightly nauseous, and I had to slow down. I still managed to clear at least nine chambers before the tracking suddenly went haywire -- I started drifting out of the building for no reason, and we ended up having to quit the app. Apart from that hiccup plus a couple of blackspots in the room (likely due to lighting), I didn't have too much trouble with the Vive Focus' inside-out tracking. While it didn't feel quite as precise as the PC-powered Vive, it still worked fine. The only time I felt sick was during the infinite maze demo, and that was the game's problem, not the hardware's. The headset had a few quirks: If I took the headset off in the middle of a game and walked around with it in my hand, it would take a little longer to reset the tracking before it could resume gameplay. Also, I found you shouldn't block either front camera with your hands when you're putting on the headset. I did have one real concern: boundaries. As much as I appreciated Vive Focus' "world-scale" tracking, I still had to occasionally either ask the demonstrators whether I was about to hit the wall, or be told to stop before I ran out of space. According to HTC Vive's China President Alvin Wang Graylin, the solution to this will be an optional setting to map out the size of your desired space, so when you're reaching the limits, you'll see a virtual fence. Could the Vive Focus implement some sort of wall-detection feature, like the original Vive? Wang said this would be too much for the mobile chipset to handle. In contrast, the Vive gets a vast amount of processing power from a PC, plus it has fixed external base stations that help track both the users and the set boundaries. But of course, here you don't get to enjoy the same flexibility and mobility as you'd do with the Vive Focus. Based on my latest hands-on experience, it's safe to say that the Vive Focus continues to be a promising start for next-gen mobile VR. Better yet, the $600 price tag seems almost reasonable when compared to flagship smartphones with similar core specs (save for cellular radio). Smartphones all lack the 6DoF tracking needed for more immersive, proper VR experiences. What remains to be seen is how many more developers will join this new Vive Wave mobile VR platform (which is basically Google Daydream for China) because the hardware is only as good as the size of its ecosystem, especially when we're looking at yet another VR platform in this young market. While current demos suggest that it isn't too challenging to port content to Vive Wave, I've only seen about seven or eight good ones, which isn't exactly a ringing endorsement from the VR developer community at the moment. But then again, HTC said to date it has sent out "several hundred dev kits," so perhaps this will change when we revisit the product early next year.